Zug, Switzerland, April 17, 2018 – Today during Event Horizon 2018 in Berlin, the Energy Web Foundation (EWF) announced several major milestones accelerating blockchain technology for the energy sector. The milestones include new features in the beta version of the Energy Web blockchain; expansion of its affiliate network; release of its first dApp, EW Origin; launch of a curated, online community, EW Connect; and a proof-of-concept sneak peek at its D3A simulation environment for blockchain-based, transactive grid operation. —Decentralized proof-of-authority (PoA) consensus with permissioned, known, industry validators that underpins unique on- and off-chain governance and creates block finality faster and uses significantly less energy than comparable solutions. —‘Secret Transactions’ that can encrypt smart contracts during validation processes and therefore keep confidential, sensitive information private, yet provide needed transparency to authorized parties, such as regulators. —WebAssembly (Wasm) integration to open blockchain development to any C/C++/Rust engineer; also will enable running blockchain clients in a web browser. —A Light Client reference implementation to run the EW chain on small IoT devices. More than 30 companies are actively participating on Tobalaba, the Energy Web’s test network. They are testing and scaling diverse use cases including transactive energy, microgrids, community solar, renewable energy procurement and trading, electric vehicle charging, and demand response. EWF Affiliates gain a significant market advantage—they will be released from the core blockchain GPL v.3 license and thus are able to build proprietary applications on top of the EWF’s open-source chain. This is thanks to a special, framework license agreement between EWF and Parity Technologies, a world-leading core blockchain developer and EWF’s strategic technology partner. In contrast, any apps built on open-source chains such as Ethereum may only release open-source software in turn. At Event Horizon 2018, EWF is unveiling EW Connect, a curated, online community for the energy blockchain ecosystem. Equal parts marketplace, collaboration platform, and center of excellence, Connect brings together EWF Affiliate energy companies with a pre-qualified network of blockchain software development vendors. EWF is also debuting two open-source solutions at Event Horizon: EW Origin and the D3A simulation environment. EW Origin records the provenance and automatically tracks the ownership of renewably generated electricity with unprecedented transparency, integrity, and detail—including location, time, source type, and CO2 emissions. Real-world test pilots will ensure that the developed technology stack meets market and regulatory needs across the globe. “EW Origin lowers costs and enhances transparency for certificate of origin transactions, improving market access for buyers and generators of all sizes, and enabling new decentralized applications based on Origin’s customizable, open-source reference implementation running on the Energy Web,” explained Ana Trbovich, Ph.D., foundation council member of EWF. The Decentralized Autonomous Area Agent (D3A) is an early proof-of-concept simulation environment for blockchain-based, transactive grid operation. EWF is releasing a companion concept brief to explain the D3A market framework. EWF officially launched in 2017 with 10 founding Affiliates, convened by co-founders Rocky Mountain Institute and Grid Singularity. One year later, EWF has grown to nearly 50 Affiliates—including the recent additions of leading blockchain innovators Electron, Share&Charge, and Slock.It—totaling US$21 million in investment and making EWF the largest consortium in the energy blockchain space. Energy Web Foundation (EWF) is a global nonprofit unleashing blockchain’s potential to accelerate the transition to a decentralized, democratized, decarbonized, and resilient energy system. 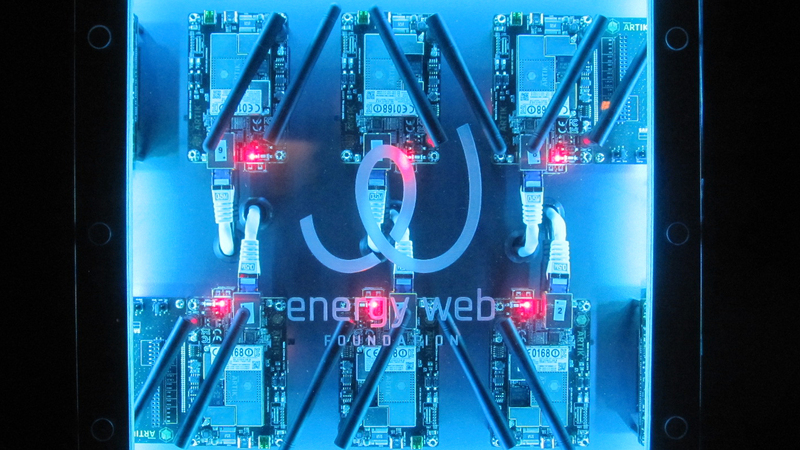 EWF is building the shared, digital infrastructure—an open-source, scalable blockchain platform—specifically designed for the energy sector’s regulatory, operational, and market needs. Co-founded by Rocky Mountain Institute and Grid Singularity, and with a worldwide network of nearly 50 affiliates and growing, EWF is poised to become the industry’s leading choice as the foundational base layer, providing the building blocks powering the world’s energy future. For more, visit http://www.energyweb.org.